Mary Austin (1868-1934)—eccentric, independent, and unstoppable—was twenty years old when her mother moved the family west. Austin's first look at her new home, glimpsed from California's Tejon Pass, reset the course of her life, “changed her horizons and marked the beginning of her understanding, not only about who she was, but where she needed to be.” At a time when Frederick Jackson Turner had announced the closing of the frontier, Mary Austin became the voice of the American West. In 1903, she published her first book, The Land of Little Rain, a wholly original look at the West's desert and its ethnically diverse peoples. Defined in a sense by the places she lived, Austin also defined the places themselves, whether Bishop, in the Sierra Nevada, Carmel, with its itinerant community of western writers, or Santa Fe, where she lived the last ten years of her life. By the time of her death in 1934, Austin had published over thirty books and counted as friends the leading literary and artistic lights of her day. In this rich new biography, Susan Goodman and Carl Dawson explore Austin's life and achievement with unprecedented resonance, depth, and understanding. 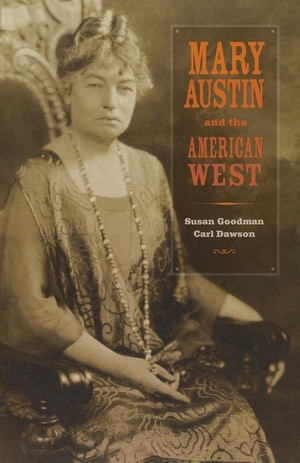 By focusing on one extraordinary woman's life, Mary Austin and the American West tells the larger story of the emerging importance of California and the Southwest to the American consciousness. Susan Goodman is the H. Fletcher Brown Chair of Humanities Professor of English at the University of Delaware. Carl Dawson is Professor of English at the University of Delaware. Goodman and Dawson are the coauthors of William Dean Howells: A Writer's Life (UC Press).